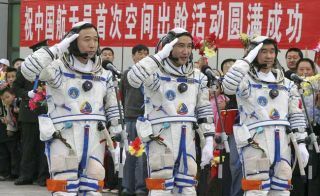 Chinese astronauts, left to right, Liu Boming, Zhai Zhigang and Jing Haipeng salutes during a ceremony before the launch of Shenzhou 7 at China's Jiuquan Satellite Launch Center on Thursday Sept. 25, 2008. Chinese astronauts are making final preparations for theircountry's first spacewalk Saturday. China's third manned mission to space, Shenzhou 7, launchedThursday from Jiuquan Satellite Launch Center in China's Gansu province. Zhai Zhigang, the lead Chinese astronaut, or taikonaut, forthe mission, is expected to become his nation's first spacewalker. He is slatedto exit the spacecraft at 4:30 a.m. ET (0830 GMT) to conduct a 20-minute excursioninto space. He will be assisted from inside the capsule by his crewmates, LiuBoming and Jing Haipeng. "The Shenzhou 7 mission marks a historic breakthroughin China's manned space program. It is a great honor for all three of us to flythe mission, and we are fully prepared for the challenge," Zhai said at apress conference before launch, the official Chinese news agency Xinhuareported. After donning his spacesuit and depressurizing the orbitalmodule of the Shenzhou7 spacecraft, Zhai is scheduled to exit the hatch and use handrails outsidethe craft to move around. "Head first and feet later," Wu Bin, an expert incharge of astronaut training with the China Astronaut Research and TrainingCenter, told Xinhua. "The astronaut is expected to greet to acamera on the spaceship surface as soon as his head and hands are out," Wusaid. Once outside the vehicle, Zhai, a 42-year-oldfighter pilot, plans to collect a test sample of solid lubricant from thesurface of the spacecraft that was placed there before the launch. Then thespacecraft will release an 88-pound (40-kilogram) satellite which will circlethe ship and send back images to mission control. A major test during the activity will be whether the new,Chinese-built spacesuit Zhai wears will work as designed. The suit (called"Feitian," meaning "fly the sky" in Chinese) reportedlycost 30 million yuan (about $4.4 million), and must protect Zhai from the harshtemperatures and radiation of space. "If you had something going wrong during the spacewalk,I think that would come across as a very significant loss of prestige andface," said Dean Cheng, China analyst with Alexandria, Va.-based thinktank CNA Corp. "Particularly if the Chinese-made spacesuits weren?tsuitable for space." The Feitian suit has 10 layers, weighs about 265 pounds (120kg), and takes up to 15 hours to assemble and put on, Xinhua reported. Within the suit's pressurized, temperature-controlledenvironment, Zhai should be able to move about in space while tethered to thevehicle through an electric cable. While Zhai is conducting his activities outside, Liu Bomingwill help out from inside the de-pressurized orbital module, while wearing aRussian-built Orlan spacesuit. Russian experts will also be advising themission from the ground along with Chinese space officials, the AssociatedPress reported. The third astronaut, Jing Haipeng, will stay inside there-entry module of the spacecraft, which is set to carry all three taikonautsback to Earth. After a 68-hour voyage into space, Shenzhou 7 is scheduled toland in Inner Mongolia on Sunday. Conducting a successful spacewalk would demonstrate a crucialability for China's space program, which hopes to eventually build a spacestation and possibly land on the moon. To do either requires being able torendezvous and dock two vehicles in space, and for astronauts to maneuveroutside the confines of a ship. "This is going to be china's first EVA [extravehicularactivity, or spacewalk]," Cheng told SPACE.com before launch. "They?vebeen trumpeting this. A whole lot of technology and equipment are all bound upin this mission." China plansto broadcast tomorrow's spacewalk live as it happens. "Broadcasting live is huge step forward in recognizing theneed for transparency as well as their confidence," said JoanJohnson-Freese, an expert on the Chinese space program at the Naval War Collegein Newport, R. I.